Called up to the Braves in May 1990, Dave Justice spent his time platooning at first base. He got into his share of games, but he wasn't a regular. Then came early August and the Braves traded away the beloved Dale Murphy. Fans didn't like it and Justice wasn't even sure the price was worth the result. But the move made Justice the Braves' regular right fielder, a job he wouldn't relinquish until five years and three World Series appearances later. "You know, you'd think I'd be happy because I get to play everyday with Murph gone," Justice told The Los Angeles Times that August, "but I'm miserable. He meant so much to me. It feels strange without him." But Justice made do, enough so to win the Rookie of the Year award at season's close, an award he attributed directly to that trade and his move to regular right fielder. Justice went on to have a long major league resume, with 14 major league seasons, three All-Star appearances, six World Series and two titles. He also sat out a seventh World Series injured. But he would also have something else on his resume: a mention in the Mitchell Report with allegations he later denied. 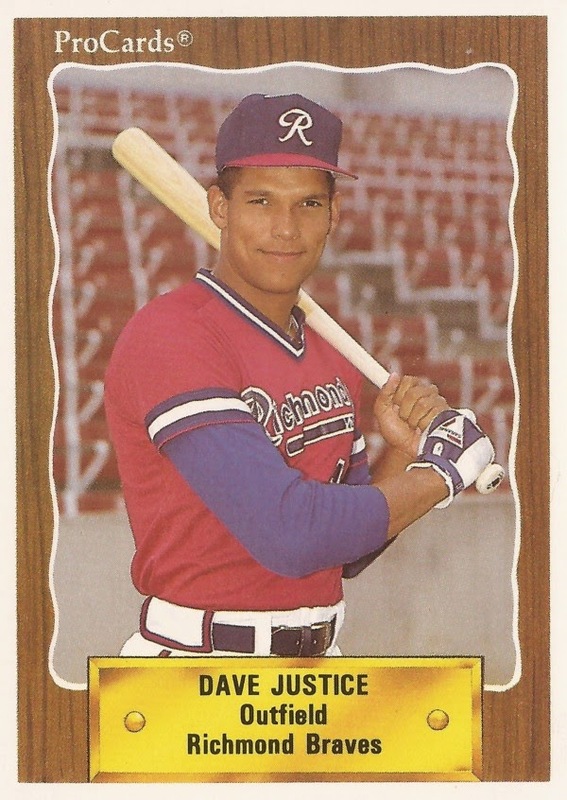 Justice's career began in 1985, taken by the Braves in the fourth round of the draft, out of Thomas More College. He made AA Greenville in 1987, AAA Richmond in 1988 and then got his first brief look at the majors in 1989. In his Rookie of the Year campaign in 1990, Justice debuted with Atlanta May 15 and went on to hit .282 with 28 home runs. Coming back for his sophomore year in 1991, Justice hit .275 with another 21 home runs. He also helped the Braves to Atlanta's first World Series appearance. That postseason Justice helped contribute to two Braves NLCS losses, after missing third base on a play where he should have scored the tying run in Game 5, and committing a Game 4 throwing error that contributed to another Braves loss in Game 4. In the World Series, though, he contributed to a Braves win, with a Game 5 home run. "For us to get a victory like this is a big boost," Justice told The Associated Press after the Braves went up 3 games to 2. The next year Justice helped will the Braves back to the Series, making a big Game 7 NLCS catch. He also provided an rallying point. "David Justice said no matter if we get down, let's stay up no matter what," Braves manager Bobby Cox told reporters. "Every pitch, every hitter - and we did." The next year, Justice had a career year and continued hitting. Justice hit .270 with 40 home runs. But the Braves missed the World Series that year. They didn't win one until 1995, and it was a Justice home run that did it. In Game 7 of the 1995 Series, Justice's home run was the difference in a 1-0, 4 games to 3, Braves victory over the Indians. "When I hit it, I knew I got it," Justice told reporters. Justice dislocated a shoulder 40 games into 1996. By spring 1997, the Braves traded him to the Indians. Then came another World Series, helping his new team get there with his offense, and his support of his teammates. "I think I'm a natural rah-rah guy," Justice told The New York Times before the Indians took on the Marlins. "Eventually, I just started opening up more, because I know only one way of playing, and that's getting behind my teammates." Justice's final two World Series came in 2000 and 2001, with the Yankees. His final year as a player came in 2002 with the Athletics. It allegations stemming from after the 2000 World Series that got Justice in the Mitchell Report. Former Mets clubhouse attendant Kirk Radomski told baseball investigators that Justice purchased HGH from him once after the series. He then later allegedly admitted to Brian McNamee, the one-time Yankees assistant strength coach, that he purchased it. To The Times after the report's release, Justice said he never used performance enhancing drugs. "This is what we've all got to deal with," Justice told The Times. "Some people are going to believe you. Some people don’t care. And some people aren't going to believe you."